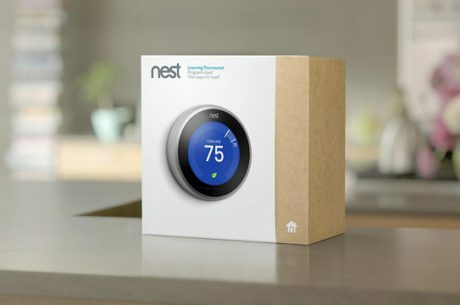 Hughes Air Heating & Cooling is pleased to offer complete sales and customized installation of these exciting new thermostats from the Nest line of smart home products. Even if you purchase your Nest thermostat somewhere else, you can still feel free to call on us for precision installation from our Mesa-area pros. We’ve been ensuring the accuracy and performance of wall thermostats for three decades. You can count on us for flawless installation of your Nest home thermostat, so it can assume perfect control over your heating and cooling systems. Thermostats have long been the temperature-setting component of HVAC systems, but it’s only recently that homeowners have added a keen ability to fine-tune their heating and cooling adjustments through the use of Nest thermostats. One of the best home thermostat options on the market today, a Nest thermostat is an app-enabled device that programs itself to your temperature preferences around the clock. By doing so, the Nest learning thermostat maximizes your energy savings without sacrificing one bit of your family’s comfort. To discover all of the incredible things a Nest home thermostat can do, contact Hughes Air Heating & Cooling today. As your certified Nest thermostat installer in Mesa, we’d love to welcome you to the wonderful new world of Nest temperature control. Saving energy is good for your wallet and good for the planet. So instead of relying on the same old programmable wall thermostats, why not step up to the high-tech capability of the Nest WiFi thermostat? By operating through an app on your smartphone, Nest thermostats give you remarkable remote control over your home’s temperature adjustments, allowing you to change settings from virtually anywhere at any time. What’s more, the Nest programmable thermostat has built-in sensors that let it learn your habits and regulate the climate accordingly while you sleep, work, wake, or stay in. It can even alert you on your phone to HVAC problems should any arise. Now that’s smart thinking for better heating and cooling at home. Ready to save energy in ways you never could before? Call our certified Nest thermostat installers today!